Halfway between the “Trocadero” and the “Bois de Boulogne”, in the heart of the 16th district of Paris, “Le Relais du Bois” restaurant and its unique atmosphere offers the authentic flavors of traditional French cuisine.In this place full of memories, our chef Michel cooks a variety of generous and hearty dishes, only prepared with fresh products. Come and discover the Relais du Bois, our team will be glad to welcome you and serve our specialties. The Relais du Bois first opened in 1944 when Mrs Giovanni, an Italian lady, settled in “rue Guy de Maupassant”. Being naturally close to famous “Bois de Boulogne”, the bar was renamed “ du Bois”. During 25 years, Mrs Giovanni offered Italian specialties to La Muette neighborhood, from the traditional osso buco to savory “blanquettes de veau”.In 1968, the Relais du Bois restaurant was taken over by Paul and Serge. Lucien, Mrs Giovanni’s former chef assistant, kept coming from time to time, to provide support to the restaurant. In 1973, Lucien took over the Relais du Bois and gave it a new personality. 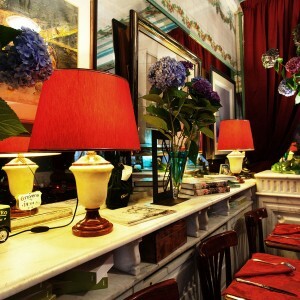 From a traditional Italian bar, the restaurant turned into a typical French bistro. Chef Michel joined the Relais du Bois in 2000. He developed his French “cuisine bourgeoise” know-how in renowned Parisian restaurants. 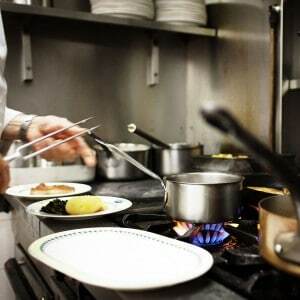 For our valuable chef, all the taste of French gastronomy is only expressed through fresh and quality ingredients. Come and savor his “foie gras” and homemade fish soup, and you will be astonished. The Relais du Bois staff is a tight-knit team that has been loyal to the restaurant for years. Our attentive personnel is committed to satisfying our guests’ needs and providing reactive and excellent service. the traditional “tête de veau” to the old-style “choucroute”, and the savory mussels. Ask our team for our daily specialties: the fresh oysters (when available), the tender “moelleux de boeuf” with morels or our “tarte tatin”. In summer time, you will enjoy tasting our “moules marinières” or sharing a melon with “jambon de Parme” in the quiet “rue Guy de Maupassant”.